There are 5 classes of Pirates. These are equivalent to the Schools in Wizard 101. Not all Pirates are created equal! Each Pirate class has a different strength or special ability. When choosing your Pirate’s class, it’s important to think about your skills. Are you quick with a musket or fierce with a sword? So you should take sometime to read about the different Pirate Classes and decide which one you might like to become. Combat is a lot different in the Pirate Spiral. You will enter a battle board, instead of a combat circle. We’ll be adding more about this, but you should read the Combat Intro first. The first thing you’ll notice is that battles are much more interactive. They will require more strategy not only to defeat opponents, but to complete missions as well. It really is rather exciting! Now in the Pirate Spiral you have both pets and Companions. Your Companions make up your crew and they will help you in battles. You will receive your first companion at the beginning of the game. As you go through various quests, you can make new friends and recruit new companions. When you have two or more, you’ll be able to decide which companion is your First Mate. That companion will be the one you run around the spiral with. The others will appear when you enter into combat. At the beginning of the game you will have to make two important decisions that will be utilized through out your pirate’s life. What are your ships colors and what will your Pirate Signature Flag look like. You will be given various options for background and image on your flag. Then you will need to pick the colors of those components. These will be used for the uniform color of your crew and the sails on your Pirate Ship. 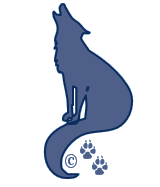 Sneaky Scarlet’s colors are dark lavender and white, and her pirate signature is a wolf.Your signature flag will be used as the mainsail of your first boat. And then it will be used on all the sails of your bigger ships. Don’t expect much out of the first boat. It’s not a big clipper ship. You’re lucky if it doesn’t fall apart in the breeze. But it’s yours! It comes with a name that you can change at one of the boat vendors. The Sickly Creeper is Scarlett’s first boat. Below on the left is a clipper ship and you can see how the signature flag is used for it’s sails. On the smaller boats, the signature flag will dominate the mainsail like the one on the bottom right. You will learn how to sail your ship through the skies and doing battle from ship to ship. These battles earn you nautical points which can help you acquire bigger ships and more equipment for your ship as well. You can place armor on its hull, change the figure head on the bow, acquire bigger cannons, sails and anchors. You can install rudders that aid in your speed, fuel consumption and navigation as well. Pets help you during battles. You can make a preference selection to run around with your First Mate or your Pet. You’ll find this setting in the options menu. Pets have their own talents and decide when and where they’ll show up for battle. You won’t be able to direct their combat, they fight all on their own. But they can appear in battles where you are to face a boss alone without your crew. So they really do come in handy! Some of the pets have the ability to fly. That too is very helpful. When you’re in the midst of ship to ship battle, your crew generally has to run across the planks to get to the other ship. Flying pets though, well they fly. So they can fly off your ship and attack an enemy on the plank without taking up a valuable combat space that might be needed by one of your crew members. So choose your pet carefully! ← We Got Our Invite! Arrrrgggghhhh!